How to Convert VOB Videos for Playing on iPhone 4S? Home » How to Convert VOB Videos for Playing on iPhone 4S? As is well-known that iPhone 4S has been released recently, and it results that groups of Apple fans rush to purchase one as soon as iPhone 4S is first sold in USA, Japan and UK. Although iPhone 4S seems to be the upgrade version of iPhone 4, it combines many more powerful function and application such as Siri. And how to play VOB videos on iPhone 4S has been a problem for those DVD lovers. Many DVD movie lovers would like to transport movies to portable devices like iPad, iPhone, iPod. 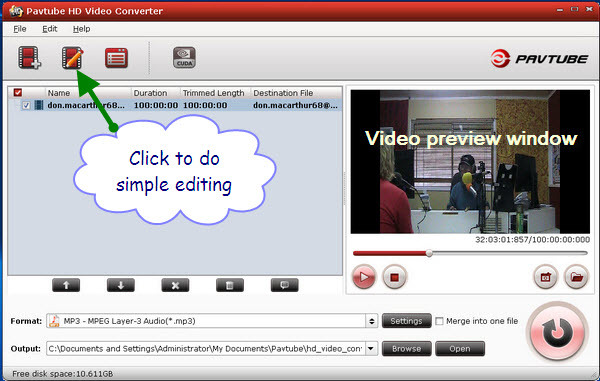 Usually, they convert VOB videos from DVD discs for iPad, iPhone and iPod with a great VOB to iPhone or iPad converter. But this time, they wonder to know whether it is possible to convert VOB videos for iPhone 4S. As iPhone 4S has not changed much in video playing function, that is to say, you can also convert and play VOB videos on iPhone 4S just like iPhone 4. Step 1. 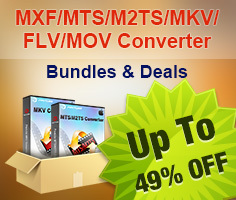 What you should prepare for converting VOB videos for iPhone 4S? Download Pavtube HD Video Converter, install and run it. Click “Trial” when a dialogue box pops up, asking you whether to Purchase or “Trial”. Step 2. Load VOB videos to VOB to iPhone 4S converter. Click on “Add” button and navigate to your target files. After the selected VOB files are imported to file list, you can edit the files by clicking on “Edit” button. You can adjust the video and audio, crop the video, add effects to the video and even replace the audio track of the VOB videos. Step 3. Set format for output videos played on iPhone, iPhone 3GS, iPhone 4 and iPhone 4S. Click on Format bar, select “iPhone” from the format list and in submenu you will find MP4 format with different resolutions and MP4 format for iPhone, iPhone 3G and iPhone 4 and iPhone 4S, select any one of them to meet your needs. Step 4. Start VOB to iPhone 4S conversion. 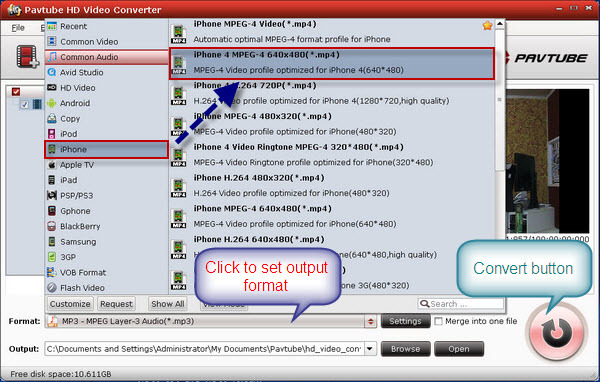 Click on the “Convert” button and the program will convert VOB videos to iPhone 4S mp4 for you to playback on iPhone 4S. After conversion finished you may sync the converted videos to iTunes and transport them to iPhone 4S. Now you can enjoy your DVD movies on iPhone 4S whenever and wherever.